I baked Basil Pesto Pizza recently. The pesto is used instead of the regular pizza sauce. 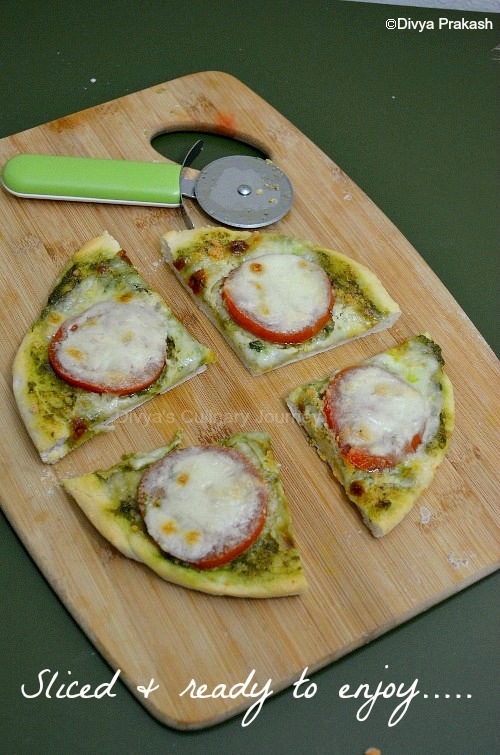 I made basil pesto pizza with tomato and mozzarella and also made them as personal pan pizza. The pizza crust was so soft and pesto was full of flavor. Everyone at home loved this pizza. I am going to bake pizza quite often from now on. In a food processor, pulse the walnuts first. Then to that add garlic and pulse. Then add basil leaves, salt and ground pepper and pulse. Then add olive oil and run till it is smooth. You can use blanched almonds instead of walnuts too. You can use this pesto to the pasta too. 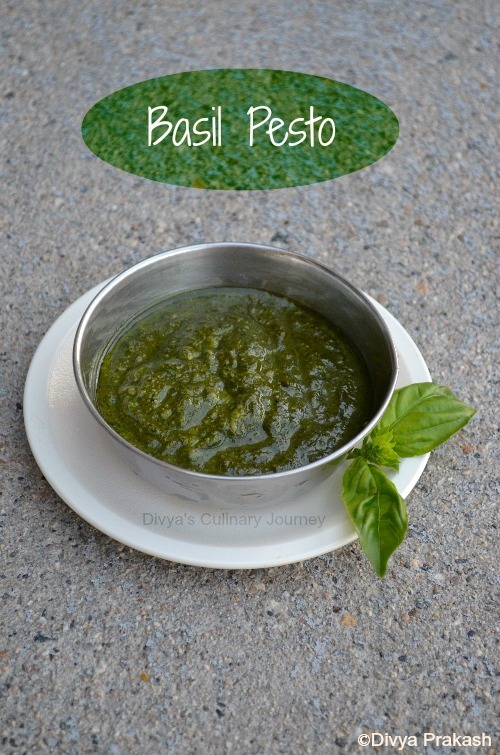 Cook the pasta as per package instructions, mix this pesto and serve. This can be prepared in bulk and frozen too. Thaw and use as required. Fresh mozzarella (thinly sliced),8 oz. Take warm water, mix the sugar and yeast and let it sit for 7-8 minutes till the yeast becomes frothy. In a bowl combine all purpose flour, salt and to this add the yeast mixture and start kneading. Then add the olive oil and continue to knead. The dough will be sticky knead till the dough is not sticky anymore. Take a bowl, oil the surface and place the dough and cover it with plastic wrap and place the set up in a warm spot till the dough has doubled, almost 45 minutes. Then punch on the dough, knead for few minutes and let it rise for another 40 minutes. Now again punch the dough and knead for 3-4 minutes. Divide the dough into 4 equal parts. Take a round cake pan, oil the surface and take one dough ball and roll out and place on the cake pan such that it fits the cake pan with the raised edges. Then spread the basil pesto, arranged the sliced tomatoes, fresh mozzarella and sprinkle grated parmesan on the top and bake till the edges turn golden brown and the cheeses are melted, approximately 15 minutes. Take out and slice and serve immediately. It yields 4 personal pan pizzas. I made personal pan pizzas so used round cake pan of size 8" diameter. You can also make 2 regular pizza of 14"- 16" diameter. It depends on the thickness of the crust. If using pizza stone, pre-heat the pizza stone for at least 30 minutes before transferring the pizza on it to bake. Also while using pizza stone, sprinkle/dust corn meal all over the base of the pizza so that it slides from the pizza stone. You can add toppings of your choice too. 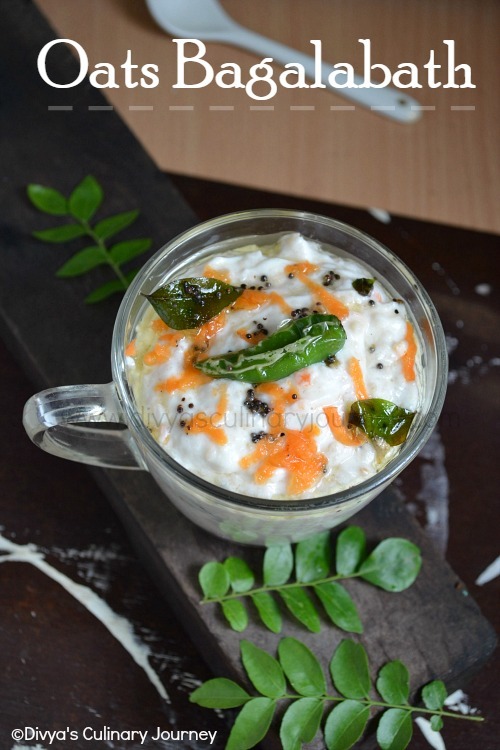 Increase or decrease the cheese as per your personal preference. Thanks for starting the Home Bakers Challenge....Your pizza is looking so tempting ..and I am sure it must be tasting gr8 with a different sauce....!! 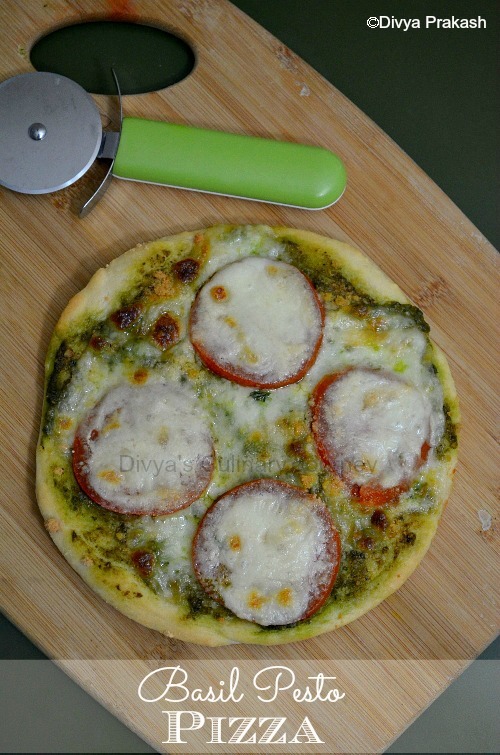 will be posting mine soon..
Hello divya.. i have linked my post... and i have fallen in love with your pizza.. so perfect shape...I will try this next time..
its my fav pesto, love this on the pizza. so tempting. Pizza looks delicious and so tempting. 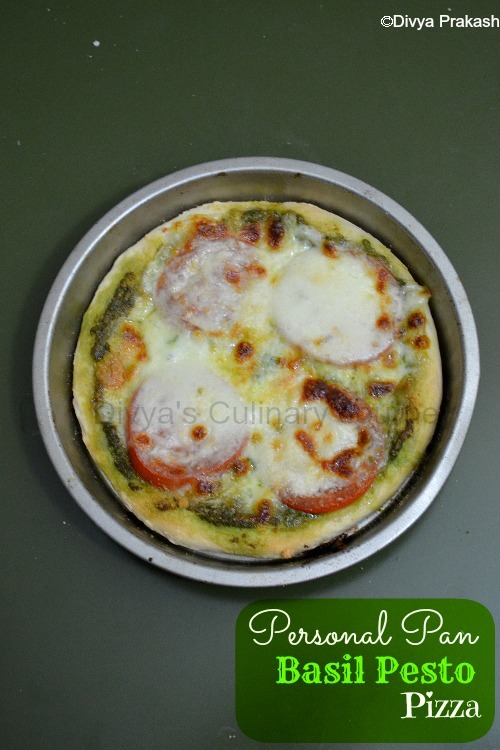 Hi Divya....The pizza looks delicious and the clicks are amazing....missed this months challenge due to some unwanted circumstances at home..:(....will surely try basil pesto with pasta. Beautiful pizza looks very tempting!! I love this basil,tomato and mozorella combo, and on pizza looks absolutely delicious.. The combo rocks Divya. Delicious and mouthwatering and picture perfect pizza that you have captured here. Love the basil pesto pizza flavor. Submitted my entry too for the event. Thanks for the challenge ! Delicious pizza Divya.. Awesome clicks... Sorry for being late.. Had been out of station for the weekend and hence couldn't prepare it on time. I was about to make pesto too but there were no nuts I could use :( The pizza is so delectable. Love it.